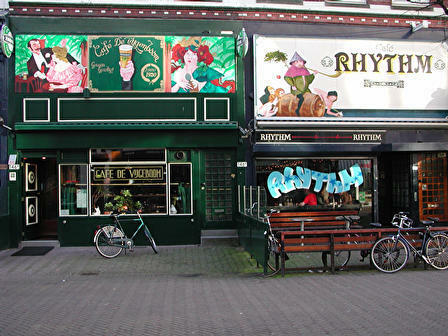 So I was out drinking in Rotterdam with a Dutch friend last night, and one place we stopped at was Cafe Rhythm. It's a grimy place on Oude Binnenweg, a bit of a biker bar that always played heavy metal when we were there before. It seems to attract a lot of alcoholics and drug addicts. The beer is cheap too, although they only seem to have Oranjeboom on tap, and Hertog Jan in bottles. Most of the people (including us) choose the latter. Yesterday they were playing dance music -- a bit incongruous, but didn't seem to disturb the crowd. This is the kind of place where you see a woman bolt out of the ladies' room to run up to the bar and berate the bartender for toilet paper. It's also homey enough that a couple of old people can sit and slowly play checkers on the table by the front window. My friend and I decided this place had great character. Heh heh ... fortunately the woman was fully clothed.